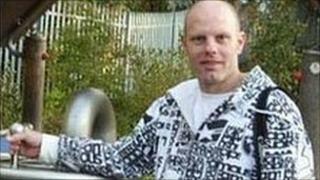 A South Tyneside man has been given a life sentence for the murder of a 38-year-old party-goer. Barry Self, of Blyth, Northumberland, was assaulted after leaving a house party in Gateshead on New Year's Day. He died five days later in hospital. Paul Robinson, 39, of Beech Street, Jarrow, was convicted of murder at Newcastle Crown Court and told he must serve at least 14 years in jail. Co-accused Russell Gladstone, 44, of Gateshead, was cleared by the jury. The court heard Robinson punched Mr Self after claiming he was trying to get into the party with a knife. However, no weapon was ever found. Judge John Milford told Robinson he had deprived Mr Self's eight-year-old daughter of a devoted father. The court was told Mr Self, who was an electrical engineer, was left lying beaten and bleeding in the snow outside the house where the party was taking place. The court heard after the killing Robinson returned to Jarrow, but then fled to County Durham, where he was caught three weeks later hiding in a loft in Hamsterley Colliery. After the verdict, Det Ch Insp Mark Anastasi, who led the Northumbria Police investigation, said: "I would like to thank all the witnesses who have supported this investigation and helped to achieve this conviction. "Our sympathies rest with Mr Self's family at this difficult time."